It's not the world of wizardry. Not a legend of hobbits either; no middle earth to fight for, no Aragorn, Gandalf and no ring. Yet it is a poignant account of human interactions; the timeless chronicle of battle for good against all evil. For over a century, the compilation of Bengali folk tales by Dakshinaranjan Mitra Majumder- Thakurma'r Jhuli - has enthralled readers, from tiny tots who sleep on grandma's lap listening to timeless stories of monsters, demons, kings and queens, to mature adults who can appreciate the complex messages portrayed by the characters in these fairy tales at a new level. As a matter of fact, during the initial years of publication, Thakurma'r Jhuli was considered a major work with strong political bias, where the evil stood for the colonial Raj and the good was the nationalistic verve that existed throughout Bengal in the early 1900s. Although in western literature 'fairies' play a dominant role in 'fairy tales', the Bengali 'Rupkotha' is most often devoid of these mythical creatures as evident from the collection of Thakurma'r Jhuli. Poignant human stories prevail; fantasy, magic and spells are associated with the narratives but they are never the central bases of the stories. Women are, more often than not, central to the plot. Although most often the victims, they are the ones who battle evil and emerge as the victors. Although the portrayal of feminine characters have been interpreted in many ways by scholars, one thing is clear, the power of womanhood is not undermined in these tales, although they themselves are crudely patriarchal in nature. The charm of grandma's folktale however lies not in the inherent message they convey but in the distinct style in which they have been transmitted over the ages. The style, selection of words, the plot- each adds to the allure of these tales. Cross-cultural interactions have brought western literature to our doorsteps. And unfortunate it may seem that Hans Christian Andersen, Aesop or even recent trends like Roald Dahl and Rick Riordan are now more common names than Dakshinaranjan Mitra Majumder, and Dinesh Chandra Sen. 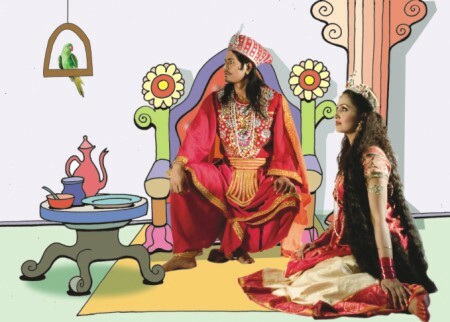 Folk tales and fairy tales are brewed from society. Although writers extrapolate and reinvent the plot, the original tone and the message of the stories remain. The compilation of Majumder is rich in the sense that it preserves the narrative of the origin of the stories - tales from the Mymensingh region of undivided Bengal- but inherently preserves the language used by story tellers of the time- grandmas, mothers and womanfolk of the household. Almost one hundred years after its publication, Thakurma'r Jhuli once again reaches a crossroad when nationalistic ideologies have gained a comeback. People are now conscious and keen to rediscover the heritage of the country. Thakurma'r Jhuli, contrary to popular belief is Bangladeshi in origin. Not only is its writer born and brought up in East Bengal, the stories featured in the book are essentially the folk tales of the region now comprising Bangladesh. To judge a folktale, one must assess its essence and its ability to transcend time. Although not quite the bedroom read, it has mesmerized readers for over ten decades, and with its revival it will continue to do so for eons to come. Hearing these wise words, the king made up his mind- “Starting tomorrow I shall do as you advise." After a day of hunting, one night the king went to visit his subjects in disguise. While walking the streets he heard voices coming from a hut. A female voice said, "Oh how I wish I was married to the King's stable boy". On a similar note, another voice desired to be married to the royal chef and the last expressed her wish to marry the king himself! The noble king said nothing and moved on. "I know what you had said. So it shall be". The first girl was thus married to the stable boy, the next to the royal chef and the youngest was taken as the queen. none another if the world you comb. The king did as his queen asked. The sisters came and with envious looks gazed upon the luxury and happiness their sister lived in. Little did the queen know that her sisters had evil schemes up their sleeves. Her Majesty gave birth to a young boy- a boy like a fragment of the moon. But they replaced the prince with a puppy and set the infant prince afloat on the river. The king asked about his newborn; in reply the sisters showed him the puppy. The next year the queen once again gave birth to another prince. 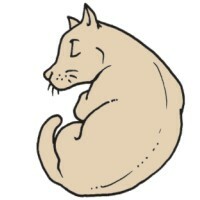 But the envious sisters again set the prince afloat and replaced it with a kitten. The king was perplexed but once again said nothing. The following year saw the royal household enlightened by a radiant princess. But this time the sisters showed a wooden doll to the king and floated the princess on the river. The events of the three years created a regal scandal and a huge uproar amongst the subjects. They hailed the queen as a witch. The king succumbed to the mass outcry and sent the queen away on exile. 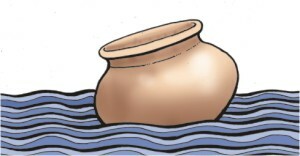 Out somewhere in the kingdom, a Brahmin was taking a bath in the river when he saw an earthenware float by. He saw the baby- a baby not like human children but created in the images of the gods. He took the child under his shelter. A year later, another boy came floating by. He thanked the heavens up above and took the child. In the third year, came floating a beautiful girl. The Brahmin was childless but in three years he was blessed with two boys and a radiant girl. The pious Brahmin was forever grateful to the gods. The Brahmin was a prosperous man. His fields were blessed with rich harvests, orchards full of ripe fruits, the Kajol-lota cow gave ample milk and now, he had his children. He named them- Arun, Barun and Kironmala. As the days passed by, the princes and princess grew up under the loving care of the Brahmin. When the three children came of age, one day the now ailing man bid farewell and passed away. At this time, at the royal castle, sorrow had no bounds. The king felt cursed and ordered to prepare for a day of hunting. But alas! As the king set out, the thunder roared, the wind blew hard and the rain fell heavily. The king took shelter under a tree. Next day, the sun shone like never before - as if it was a season of drought. The king, beleaguered by thirst, looked out for habitants. In the distance he saw the three siblings- Arun, Barun and Kiron. He went and asked for water from them. Arun, Barun and Kiron brought water and gave it to him. As he drank, the king wondered how such beautiful children came to be in his Bijan land. Finally after twelve months and thirty-six days the castle was completed. And what a castle! It had no comparison. One day a hermit passed by and marvelled at the spectacular building. What is missing, what is not, thoughts just bristle. Seek the golden fruit there on the diamond tree. Search there for golden bird that flies free. Only to the gallant can everything be found." And as he did, he turned into stone. Kiron brought out the arrow the next day and saw the top had fallen off. But she did not shed tears. 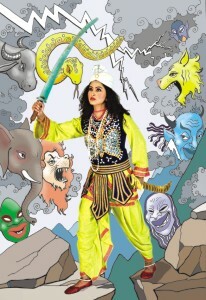 Kiron did her daily chores, put on the garbs of a prince and headed towards Mayapahar to rescue her two brothers. After thirteen nights and thirty-three days she reached the enchanted mountains. But Kiron was not a prince and she did not look back. The enchantment could not touch her. Kiron did as she was told and finally banged the gong! And as she did, petrified princes of countless ages came back to life. 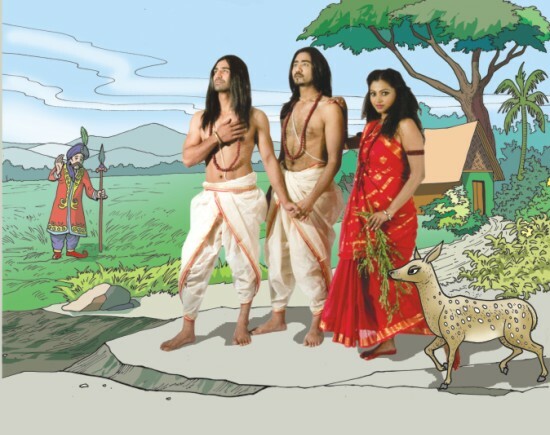 Returning to their abode, Arun, Barun and Kironmala fed Kajal-lata; untied her calf, patted the fawn, cleaned the courtyard and sowed the seeds of the silver tree; and planted the branch of the diamond tree. Instantly the trees grew and pearl flowers blossomed. Wild birds came and saw the castle; wild deer came and saw the castle, how could humans not? It was as if Indra's heavenly abode had come to earth. The news soon reached the king. “The Children of the Brahmin did all that?” exclaimed the king. That night the Golden Bird asked Arun, Barun and Kironmala to invite the king for dinner. “These children have done all this?” How he wished he had children like Arun. 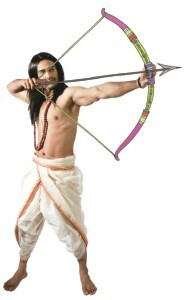 Barun and Kironmala. When the king sat to dine, the smell of food filled the air. As he removed the lid, the King was astonished to see gold coins instead of food. The king suddenly realised the mistake he made years ago. The king embraced his long lost children. Jewels of the three worlds you must be. It seemed there was no tomorrow. Tomorrow is a new saga." “Arun, Barun and Kiron, in a hut on the other side of the river, you shall find your mother. Her life is full of pain and sorrow. Bring her,” said the Golden Bird. And thus the whole family was reunited. The king ordered the execution of the evil sisters, and shifted his capital to the castle built by his children. The King and Queen thereafter reigned for many, many years along with their children and grandchildren.